Adobe Analytics is well suited for large companies. Small businesses would definitely not benefit from it because it's expensive and most small business most likely don't need the complexity of implementation and customization effort that comes with the solution.However, companies with many employees and different needs of user roles; companies with several sites; apps and managing different countries, companies with very complex sites and need of data will definitely find value on Adobe Analytics because it is an enterprise worthy solution. Centralizing data/insights from disparate variety of data sources. Collaboration between users, including across different departments. Self service analysis, slice & dice, for business users. Sharing of insights within the organization. Discussion on data itself. Every single page & card has dedicated chat channel. Insights consumption on the go. Domo's mobile app is best. Alerts on key metrics. Domo supports alerts into SMS, mobile app notifications, emails. Joining different datasets from various data sources allowing wider perspective on insights. And this is very user friendly for business users to do this themselves. Able to connect to hundreds types of data sources, from databases to web cloud apps. Handling large datasets. Our largest datasets are in the range of hundreds of million rows. Live queries analysis. There are many better tools for this purpose, Domo currently requires import of data first before analysis can be done. Ad-hoc exploratory analysis where dataset needed is not yet fixed/clear. Navigating plethora of data. Domo needs to come up with Data Catalog as a feature. Reliable servers providing excellent uptime. Extensive customization which includes a significant amount of custom variables, limited only by coding ability and imagination. Continuous development with new features and enhancements released often. Centralizing data/insights in a single platform. Domo supports hundreds of connectors for different types of data sources, and once the datasets are in Domo platform, they can be joined and available for slicing and dicing snappily. Self service. Once datasets are in Domo, users having access to that dataset will be able to easily build their own visualization for analysis and monitoring on their own. Users can also connect their own data (e.g. spreadsheets, .csv files) that can then further be joined with the available datasets. Collaboration. The possibility to have discussion *on the data* itself is amazing. Every single dashboard page and chart card has its own chat channel, where people can mention colleagues, attach images & files, both publicly (visible/readable by everyone having access) or privately (only specifically for mentioned users). Alerts, including near real time alerts. Domo allows alerts to be defined by any of the users having access, which can then be shared for others to reuse (subscribe to alert) as well. Domo delivers alerts via SMS, mobile app notification, in-browser notification and email. Powerful for executives who would like to be made aware when certain key metrics changes significantly. Insights on the go. Domo's mobile app is currently unparalleled by others in terms of insight consumption and basic exploration. Able to handle large datasets. Our largest datasets are in the range of hundreds of millions records per dataset. In total we have more than 10 billions rows from hundreds of datasets. All in one platform. By pareto 80-20 principle, just by deploying and utilizing Domo well, you will get 80% of your data/insight use cases resolved. Support is overseas and sometimes slow to respond - I've had issues with support really understanding my questions, often issues have to be escalated. Oftentimes it takes the full 24 hours to respond, not sure if this is because of time differences or what, but most other companies using overseas support agents seem to respond in a more timely fashion. Also, it is rare to have an issue resolved on first contact. Context for the reports/metrics - It is easy to look at data but interpret it wrong because you aren't really looking at the right metrics or the right data points. DOMO lacks more advanced Admin functions for managing data sets, calculations, users, etc. DOMO needs to improve their data upload application, used to pull data from on prem data sources and upload to the DOMO cloud. It lacks functions to manage a large number of jobs and needs a better scheduling tool. DOMO has a mobile app, that is pretty good, but certain types of cards and features are not supported in the app. This creates extra work and is a drag on the user experience. I don't make this decision, so this is my estimation - Analytics meets most of our needs, and switching to another platform would not be technically feasible. Domo is a great up-and-coming product. There are many fantastic features that are extremely compelling to our end users, which makes Domo a great fit for our organization. As with many BI tools, there are items on the wish list that could make implementation, administration and usage easier, but I believe these will be addressed over time as the product matures and evolves. The overall concept and approach of this solution has definitely raised the bar in this area of expertise and I would like to see things advance in giving the enterprise tools that will make decision making easier and more robust in the future. Customer service has always been the Achilles heel for this product. Support is often slow to respond, if at all. Account management has seemed to get better recently. Because support has been really good. It was a breeze. We had it implemented and were using it in production within weeks. Even before the POC was schedule to end. Google Analytics has a less steep learning curve. The visualization tools are better. The dashboards are more configurable. The software also stands out for its collaborative nature. 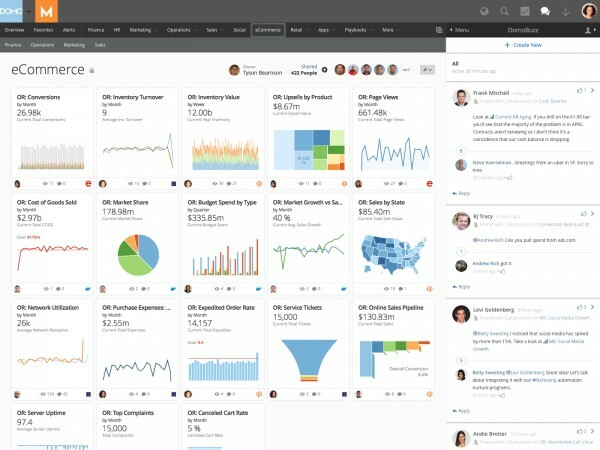 It can integrate with different datasets, including social media, spreadsheets, and most enterprise business systems.Domo is positioned as a self-service BI tool for varied user types, from the department staff to the tech engineer. As such, it is easy to use and is conveniently accessible via a single dashboard. It is also useful for users that demand real-time insights.